Hawaiʻi Island Police are investigating a shooting incident which occurred in the Kona district that left one woman seriously injured. At about 7:07 p.m., Wednesday, (March 20), patrol officers responded to the Kona Community Hospital, where a female party had been transported by private vehicle for a single, non-life threatening gunshot wound. Police began to look for a suspect, identified as 41-year-old Walter Gomes III, of Kona. This morning (March 21) at about 2:05 a.m., Kona patrol officers located Gomes and his vehicle near Maiau Street in Kona. Upon contacting Gomes, he refused to comply with officer’s verbal commands and drove his vehicle toward police, striking a police vehicle. Three officers discharged their firearms; however, the driver was able to flee the area. As is standard practice in any police-involved shooting, the Police Department’s Area II Criminal Investigations Section is conducting a criminal investigation into the shooting and the Office of Professional Standards is conducting an administrative investigation. Gomes was last seen operating a white 2003 Cadillac Escalade, license plate ZFC915. 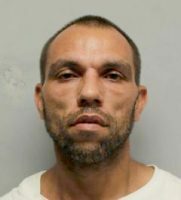 Police caution the public from approaching him, as he is considered armed and dangerous and instead are asked to call police at (808) 935-3311 to report his location. Additionally, anyone with information regarding Gomes or the incidents, are asked to call Detective Brandon Mansur at (808) 326-4646 ext. 301 or email at brandon.mansur@hawaiicounty.go… or the Police Department’s non-emergency line at (808) 935-3311.